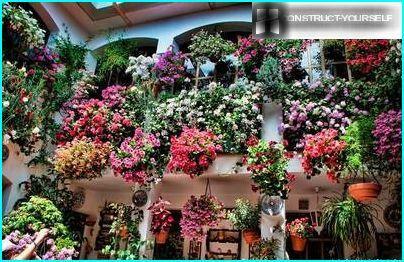 From the French word "pots" is translated as"Hidden Flower". Over time, the clay pots, which is most often grown petunias, covered with white spots and lose their attractiveness. It was then set them in a separate container, which serves mainly a decorative function. From what we can do for petunias pots with their hands? Of all the things you can find in the economy and is no longer necessary for you. It may be an old garden buckets, the rim of the wheel, tire or have served their suitcases, chairs, teapots, and even all kinds of shoes. It would be a desire, free time and irrepressible imagination. 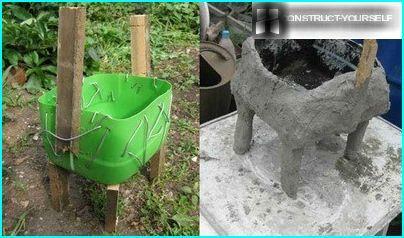 How to make your own pot? 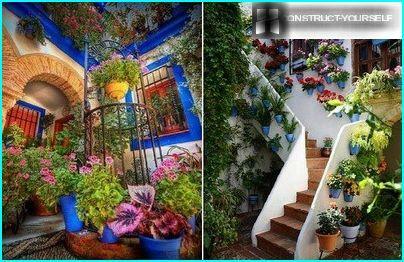 If the planter is in a warm room, thenthe most suitable material for it will be wood, plastic or ceramic. 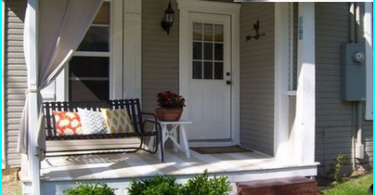 For the street, winter garden or unheated porch fit more cold-resistant variants: fireclay clay or earthenware. 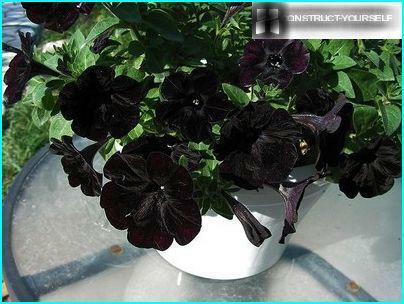 If grown petunias in pots, you need trays, rescued in the irrigation period. You should always be possible to drain the water. Frankly, this is a decorative device used is not necessarily, but obtained with the help of aesthetic pleasure will never be over. 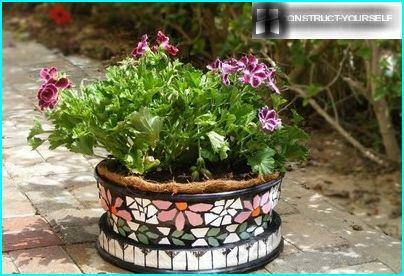 You can completely from the beginning to the end of the makedecorative pot from virtually nothing. And color it will be good, and without flowers, he will be a real decoration of any plot. That this is our red cat-bed, whose birth we will clearly demonstrate now. The basis of the flower bed will be a plastic bottle, butfor this it will need to be cut. On the basis will be applied grout. That he did not pull away on slippery plastic, it can be densely Okrut wire. The framework should be to bring down the wooden rails, and then tie it to the prepared container. Knead the solution at the rate of 1 part sand to 1part cement. We need consistency of thick cream. 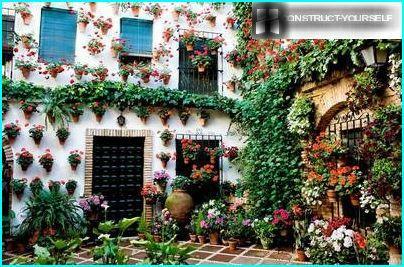 In no case do not add to the overall solution of gypsum, because with it the mass hardens instantly. Wear rubber gloves. Recruit a handful of the solution in your hand and add to it one tablespoon of gypsum. Kneaded mass in the arms, form a sausage out of it or a ball and attached to the frame, creating a form of figures. Lepim muzzles of the balls as if working with plasticine. Before placing lubricate it with water on the trunk of small details. Polishing the surface of the body need to figurehand dipped in water. Ready flower garden should not crack. To do this, it must be dried under the plastic wrap for 3-4 days. On the first day of the drying process is best figure moisturize several times. 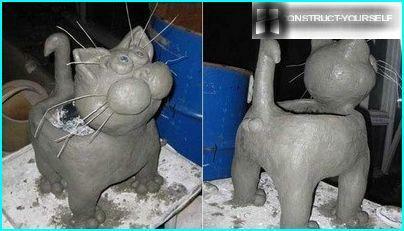 The surface of the finished cat sanded with sandpaper. 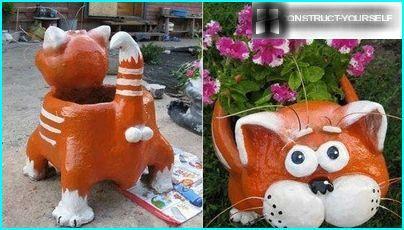 Paint the cat can be using a car or water-based paints, enamels. The finished figure varnish. This garden pots afraid of severe frosts. If it is to preserve and upgrade, it can last for a very long time. Recently, the fashion for petunias, who lovedand appreciated even by our grandmothers returned. Once again, we admire the lush and colorful clouds in fine suspended pots, flowing and entwined pergola with garlands and colorful flowers growing in the flower beds and along garden paths. This hybrid plant varieties that can be divided into groups. For flower beds, perennial borders and rabatokbush petunia fits perfectly. Small varieties may be grown in containers. Multiflora flowers Subgroup features a large number inflorescences medium size. In the subgroup grandiflora flowers can reach 16 cm in diameter (Triumph of the grade). The most famous series of Fantasy, Dream, Titan, Polaris, Storm, Hit Parade and early variety Ultra. Formation of the bush takes place independently. If you want to affect the appearance of the plant, enough to cut off its top at the third interstices, while the flower begins to branch out and become more elaborate. The group is called the floribunda. It averaged an option that its characteristics can be placed between the multiflora and grandiflora. Mass planting often decorated terry floribunda. The most popular are sortoserii Celebrity and Sonia. Cascading groups may sprout, whichgrow in all directions, forming dense thickets of flowers. 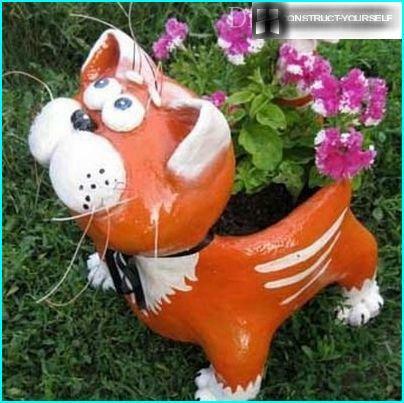 This is a great decoration for arbors, porches and terraces. Scourge of up to 1.5 meters emit remarkably beautiful varieties Typhoon, Rose, Cherry, and Ramblin Silver. Unlike cascading species emit ampelnyeshoots are directed just down. 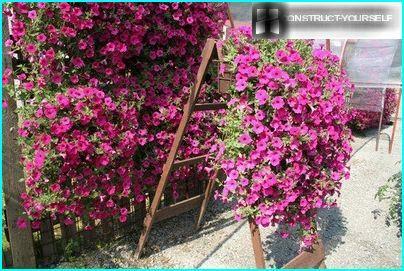 These varieties of petunias are perfect for hanging pots. However, landed on a flower bed, they form a beautiful flower cover on the ground. More about ampelnye grades offer watch the video. Thus, the flower we have, with the desired varieties weundecided. There comes a time to plant, grow and enjoy the result. You can buy seeds, but beginners should start with a seedling ready. Before you prepared to grow seedlings petunias in pots, make sure that at night have established positive temperature, freezing and your sprouts are not threatened. Plentiful food - an important part ofhealthy plant life. Often, wanting to make an impression on buyers, sellers put on the three-liter pot at the root. They will inevitably die because of malnutrition. Kustov and floribunda types need 1-2 liters of land at the root. Cascading and hang-downing more voracious, and their need for land is 3-5 liters per 1 root. Tornado and Typhoon - powerful varieties that require 7-15 liters per root. Pondering how you plant petunias in pots, remember: from one to another of the central stem distance should be at least 15-20 cm If the plant is simply strangle each other.. The problem is a simple vegetable garden soil isthat it is too heavy for the delicate flowers. Between waterings he can go cracks. If it is not loosen continuously, the roots will suffocate. 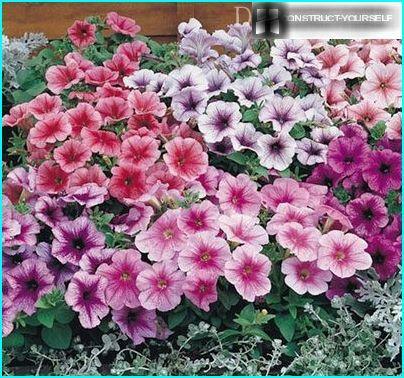 Therefore, when you plan to produce planting petunias in pots, stock up on good ground. 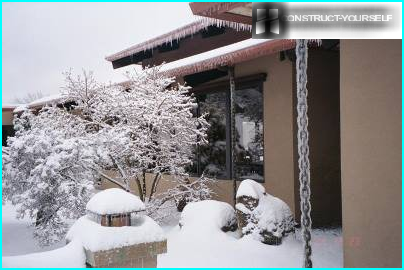 It corresponds to the following characteristics: high friability, moisture permeability and lightness. Note the ground foundation whichIt is peat. A bit of vermicompost and sand will not hurt, and vermiculite and perlite make it loose. Another option usable soil is: garden soil, peat and disintegrating agents in the proportions of 3: 3: 0.5. This land will be quite nutritious, air- and moisture-permeable. 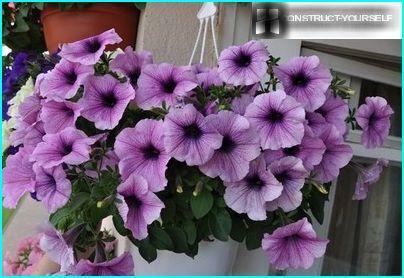 In principle, care for petunias in pots is simple. In addition to food, you need to take care of watering, shower, haircut and plant protection from diseases. If the disease - it is a topic for another big talk, something about the other components of care should briefly describe. Watering. The plant is watered twice a day, morning and evening. 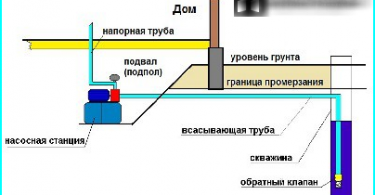 If this mode you do not have the strength to use the hydrogel or automatic watering. When watering in the heat of the roots are just cooked, so you can not do this. In May and early June, when the evenings are cool more, the second day watering can be eliminated. Shower. Spraying Bush not onlygive him the moisture across the entire surface, but also helps in the fight against spider mites. It is impossible to water droplets on the leaves fall when the scorching sun. Flower can get burns. A haircut. Wilted flowers are removed, then the plant will delight you with new buds, and not to engage in seed formation. In mid-summer and autumn shoots are cut. Then they will always lush and fresh. In addition to all the above plants there is still the need for fertilizers, which also must be met. And we will certainly talk about it, but a little later.